Nutrition is the cornerstone of good health. We eat at least three times per day-making nutrition one of the most important parts of our lifestyle. If you have a poor diet, it impacts your entire day and night. And if you have a healthy diet it also impacts your entire day and night. It is a sorry state of affairs when analysis of foods for children reveals that 70 percent of children’s food products are too high in sugar- one of the most damaging ingredients to the human body, and 23 percent are high in fat. Given that the incidence of obesity and heart disease is on the rise in the younger generation, it is time that parents wake up and take action. When you feed your children unhealthy foods, high in sugar and fat, and don’t find ways to incorporate fresh fruits and vegetables into their diet, you are impacting the quality of their entire life. The nutritional status of a child affects his/her immune function, mental function and overall health and well-being throughout life. And while children may not show any symptoms of ill-health while eating a poor diet, significant harm is occurring internally, which, over time, will manifest as disease. The sickest adults I treat in my practice inevitably grew up with a poor diet. And the healthiest grew up with a parent or parents that ensured that they had the proper levels of nutrients in their diet and low levels of harmful ingredients like refined sugar and fried foods. -Do not buy foods that have refined sugar or any hydrogenated fats. Save money by staying away from packaged cereals, crackers and chips that are marketed to children. You are paying for the packaging and marketing while the quality of the foods inside is usually poor. -Stay away from fast food. -Make nutrition a priority in your household. 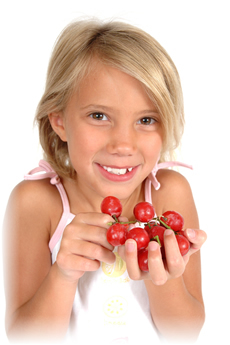 -Start an organic garden and get your children involved in the process. They will be more likely to eat and enjoy the produce that they had a hand in creating! The reward for this effort? Calmer, more peaceful and healthier children. ScienceDaily (July 15, 2008) — Most kids’ foods provide poor nutritional quality, but packaging claims and healthy images could be misleading parents, according to a Canadian study. Professor Charlene Elliott used US guidelines to review 367 products. 70 percent of the products had higher than recommended sugar levels, 23 percent had high fat levels and 17 percent had high salt levels. Nine out of ten regular food items aimed specifically at children have a poor nutritional content — because of high levels of sugar, fat or sodium – according to a detailed study of 367 products published in the July issue of the UK-based journal Obesity Reviews. Just under 70 per cent of the products studied – which specifically excluded confectionery, soft drinks and bakery items – derived a high proportion of calories from sugar. Approximately one in five (23 per cent) had high fat levels and 17 per cent had high sodium levels. Despite this, 62 per cent of the foods with poor nutritional quality (PNQ) made positive claims about their nutritional value on the front of the packet. “Children’s foods can now be found in virtually every section of the supermarket and are available for every eating experience” says Professor Charlene Elliott from the University of Calgary, Canada, and a Trustee of the Canadian Council of Food and Nutrition. Only 11 per cent of the products Professor Elliott and her colleagues evaluated provided good nutritional value in line with the criteria laid down by the US-based Center for Science in the Public Interest (CSPI), a non-profit agency that received the Food and Drug Administration’s highest honour in 2007. The CSPI nutritional standards state that healthy food should not derive more than 35 per cent of its calories from fat (excluding nuts and seed and nut butters) and should have no more than 35 per cent added sugar by weight. They also provide guidance on sodium levels, ranging from 230mg per portion for snacks through to 770mg per portion for pre-prepared meals. CSPI’s standards are adapted from those developed by the National Alliance for Nutrition and Activity, a coalition of some 300 health and nutrition organisations in the USA. The organisation states that its standards represent a compromise approach. They allow for the marketing of products that may not be nutritionally ideal, but that provide some positive nutritional benefits that could help children meet the US Government’s Dietary Guidelines for Americans. The 367 products included in the study were bought from a national supermarket chain stocking 50,000 food and non-food items in December 2005. Each had to meet very specific criteria. Each product was subjected to a 36-point analysis that included the nutritional content and how the packaging was designed to appeal to children and their parents. 63 per cent of all the products surveyed made some sort of nutritional claim, including 62 per of the products that could be classed as poorly nutritious, due to high levels of sugar or fat or sodium. A low percentage (eight per cent) carried some kind of nutrition mark or seal. Other claims included that products were low fat, a source of calcium, contained no artificial flavours or colours or provided a number of essential nutrients. Products with high sugar levels accounted for 70 per cent of the goods with PNQ. Despite this, 68 per cent included some sort of nutritional claim on the package, such as a source of whole grains, source of iron or low in fat. Cereals and fruit snacks were particularly likely to make nutritional claims and have high levels of sugar. Just under 23 per cent of the products had PNQ because of their high fat content. Yet 37 per cent had some sort of nutritional claim on the package. For example peanut butter mixed with chocolate claimed to be a “source of six essential nutrients” and a pizza product claimed to be a “source of calcium”. High sodium levels meant that 17 per cent of the products analysed were classified as being of PNQ. Despite this, almost 34 per cent made some sort of nutritional claim on the package. Crackers and pizza products were among the worst offenders. A fifth of the products featured a cartoon image engaged in some sort of healthy physical activity on the front and a quarter showed these on the back or side of the box. Activities included skateboarding, basketball and biking. “Assessing the levels of sugar in the selected food products was a methodological challenge, because milk sugars and fruit sugars occur naturally in foods” says Professor Elliott. “The Nutrition Facts label only displays total sugars and the quantity of added sugars is not always provided by the manufacturer. The problem of accurately separating figures for quantities of natural and added sugars in manufactured products has also been encountered by other researchers and acknowledged as an issue by CSPI, so it is not unique to this study. nd Europe and is linked to a range of health problems including type 2 diabetes, high blood pressure, heart disease and some forms of cancer. Overweight children can also suffer from psychological and social consequences because of their weight. Professor Elliott believes that policy attention needs to be directed towards the nutritional claims made by products aimed at children and the images they use to sell the products. This entry was posted on Thursday, July 17th, 2008 at 8:00 am and is filed under Childhood Nutrition, Diet and Disease, Latest Nutritional Research, Prevention. You can follow any responses to this entry through the RSS 2.0 feed. You can leave a response, or trackback from your own site. I linked to your site, but I don’t think the ping came thru on your end. oh well.